Windsor, ON: ENWIN Utilities Ltd. (ENWIN) and Essex Power Corporation (Essex Power) announced today that a charitable partnership between the two local utilities has resulted in substantial donations to two local health organizations. The local electricity distributors presented two cheques – each totalling $33,350 – one to the Ronald McDonald House Windsor, Southwestern Ontario Chapter (RMH Windsor) and the Windsor Regional Hospital Nephrology-Renal Dialysis Program. 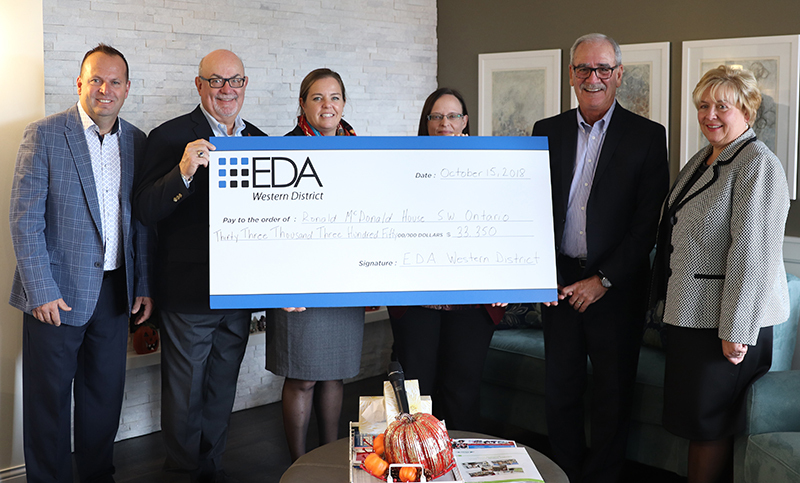 Together, the two local utilities raised this money by co-hosting the Electricity Distributors Association (EDA) Western District 6th Annual Charity Golf Tournament, on September 25, 2018, and collecting more than $66,700 in donations from the hydro distribution sector, industry sponsors and friends. Essex Power CEO, Ray Tracey, who is also the Chair of the EDA Western District, spoke about the EDA’s long-term commitment to supporting local Ontario communities. ENWIN President and CEO, Helga Reidel, agreed. 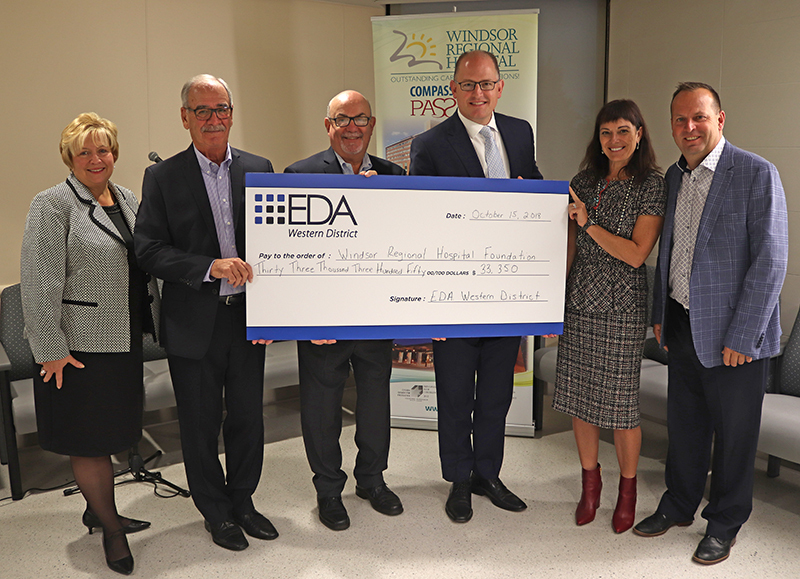 The $33,350 donation to the Windsor Regional Hospital Nephrology-Renal Dialysis Program will provide new Renal Dialysis chairs for patients affected by chronic kidney disease. Monica Staley Liang, Vice President of Regional Cancer Services, Renal/Patient Relations and Legal Affairs for Windsor Regional Hospital, expressed the hospital’s gratitude for the donation that will provide comfort during long hours of dialysis. “Having the EDA Western District, Essex Power and ENWIN assist with providing funding for new chairs through their golf tournament speaks well to community support for this vital medical equipment,” she commented. Christine Richer, Manager, Ronald McDonald House Windsor, also thanked the utilities for a $33,350 donation to RMH Windsor, which will help to support an area of respite for families with children in treatment at Windsor Regional Hospital. “The funds donated by these local utilities will help support an area of respite to allow families to shower, refresh, re-energize and recharge before heading back to their sick child’s bedside,” she added. This is the second time that ENWIN has collaborated with Essex Power and the EDA to co-host this tournament. The first collaboration, in 2013, raised $39,000. In partnership, these local utilities have now donated a total of more than $105,000 to local charities. Windsor Mayor, Drew Dilkens, LaSalle Mayor, Ken Antaya and Tecumseh Mayor, Gary McNamara were also on hand to congratulate the donor utilities and the recipients, and expressed their appreciation for the local charitable efforts of our local utilities. The EDA Western District is the local voice at the Electricity Distributors Association (http://www.eda‐on.ca), an organization representing all Local Hydro Distribution Companies (LDCs) in Ontario. The EDA Western District members include, Bluewater Power Distribution Corporation, E.L.K. Energy Inc.; Entegrus Powerlines Inc., ENWIN Utilities Ltd., Erie Thames Powerlines Corporation, Essex Powerlines Corporation, London Hydro Inc. and Tillsonburg Hydro Inc. The EDA Western District represents approximately 408,000 residential and commercial electricity customers in Southwestern Ontario. ENWIN Utilities Ltd. is the licensed electricity distribution company serving customers in the City of Windsor. ENWIN is also the licensed water system operator for the water system owned by Windsor Utilities Commission. ENWIN works with Windsor to provide a safe, reliable source of electricity and water for our community. At ENWIN, the true power lies in working together. Ronald McDonald House, Windsor and Southwestern Ontario Chapter provides welcoming home environments that give families emotional and physical comfort and support as they stay close to their seriously ill child, as quite often families travel far from home for medical care. Ronald McDonald House Charities Southwestern Ontario is a growing chapter that continues to expand its services in order to help more families with seriously ill children. The three core programs ‐ RMH London, RMH Windsor and the Ronald McDonald Family Room ‐ each keep families close to their seriously ill child's medical care when it matters most. Windsor Regional Hospital – Nephrology‐Renal Dialysis Program, based in the Bell Building at the Ouellette Campus of Windsor Regional Hospital cares for over 400 patients weekly. Renal kidney dialysis involves the artificial replacement of the process to eliminate waste from the blood, due to lost kidney function. The dialysis process is commonly used for patients suffering from chronic kidney disease. The Regional Renal Program has grown 45% over the last five years, completing over 43,000 treatments of hemodialysis patients in the Windsor‐Essex region. The regional program consists of 30 new stations at the Bell Building; 10 in the Jeanne Mance Building; 7 stations at Erie Shores Healthcare in Leamington and; 4 inpatient stations servicing patients admitted in Regional Hospital. The enhanced program in the Bell Building provides more space for the patient with a brighter layout due to large windows, higher ceilings and a more comfortable setting. Patients who require kidney dialysis up to three times per week need to sit in a renal chair for up to 3 to 4 hours for each procedure. The new area also provides more working space for the required medical equipment needed for each patient.